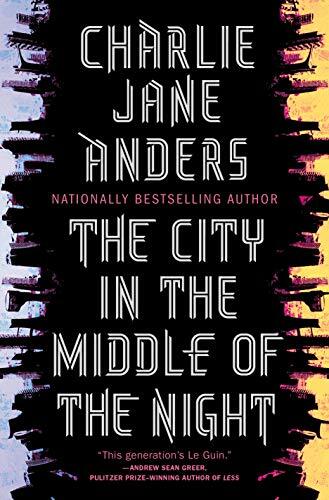 The City in the Middle of the Night by Charlie Jane Anders is superbly written social science fiction as well as an intimate portrayal of individuals who are damaged by their societies. A quote on the back of the book bills Anders as “this generation's Le Guin,” and the comparison is apt. The cities of Xiosphant and Argelo are reminiscent of Anarres and Urras, the two planets of Ursula K. Le Guin's The Dispossessed, with the same level of cultural authenticity and thoughtful exploration of politics, government, and attempts at societal change. The story takes place on January, a planet tidally locked with its sun, leaving half the planet perpetually in sunlight and the other half perpetually dark. Humans can't survive in the blazing Day or the freezing Night, so they live only in a narrow twilight band between the two. In Xiosphant, where the story begins, society deals with this environment by imposing fierce laws delineating periods of day and night and strictly enforcing societal norms. In Argelo, people live how they wish, with huge stratification between rich and poor and little in the way of government at all. Both cities are crumbling as the technology keeping them alive declines, but neither society is capable of dealing with change. Instead, both cling to the self-destructive ideals that are causing many of the problems in the first place. The other major character, a woman named Mouth, is harder to connect with at first. The tribe of nomads she grew up with all died, leaving only her alive, and she's driven by survival guilt and a need to define her identity without them. As Sophie follows Bianca from disaster to disaster, Mouth follows Sophie, seeking some kind of larger meaning that will give her life purpose. Mouth does become more sympathetic as her backstory is slowly uncovered, including important revelations about the planet itself and the impact of its human habitation. Mouth summarizes her own struggle and that of the book's major characters: "The dead were just like the living: they all wanted something they could never have." But humans are not the only inhabitants of the planet. The Gelet, or "crocodiles" as most humans call them, are an alien race that live in lava-heated underground caverns in the Night. Sophie is the first to comprehend their intelligence and connect to them despite their fearsome and disturbing appearance. The survival of the Gelet is threatened by humanity, though humans are unaware of it. Sophie tries to bring understanding and communication between the two species, but the task seems almost impossible. How can humans be brought to care about the plight of creatures they find repulsive, or to believe that they have irreparably destroyed the climate of the planet? The main disappointment of this brilliant book is the ending, which cuts off abruptly, in mid-action, with little resolution of any of the book's major problems or themes. This certainly suggest a sequel is on its way, but the reader is left with an incomplete tale. Despite that, this novel is likely to garner major awards attention for its many-layered and nuanced characterization and themes.